By assigning labour rules to staff (established in collective bargaining agreements or individual labour contracts), you can calculate types of remuneration or compensation (wages, overtime, vacation days, days-in- lieu) and monitor agreed holiday time, absences, owed sabbaticals, training, minimum booking times etc. 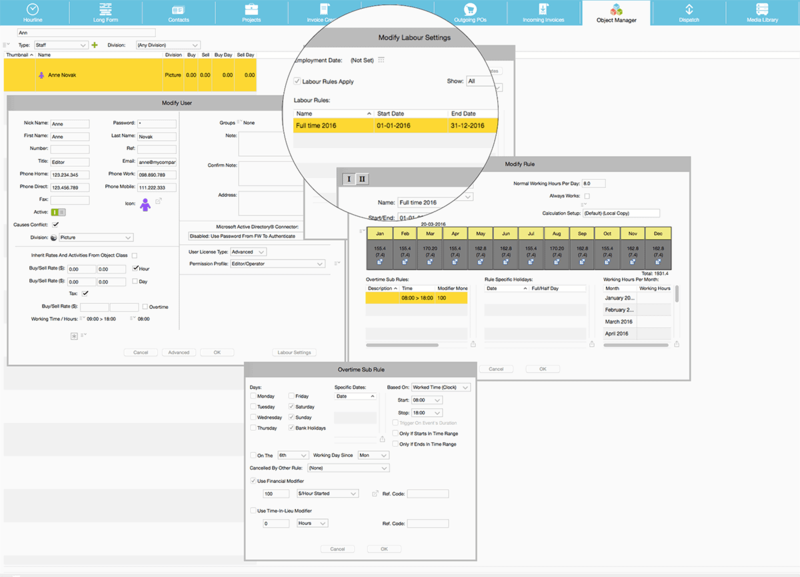 The Advanced Personnel Management Module is designed for companies that want to track the worked time, overtime compensation, earned vacation, etc. of their employees on a more advanced level than the standard Personnel Management function in farmerswife provides. The module itself is integrated into the Long Form > Personnel Tree. This module offers a set of rules for how the labour rules should be calculated during a period of time. This typically comes from an agreement – sometimes a union agreement and sometimes an individual agreement between employer and employee. A rule specifies the working hours per day and per time period, overtime payment, holidays, vacation, etc.